On her wedding day, a bride wants to feel and look her best. No matter what your personal style is, here are 15 swoon-worthy wedding hair ideas to that will make you feel beautiful on your big day. 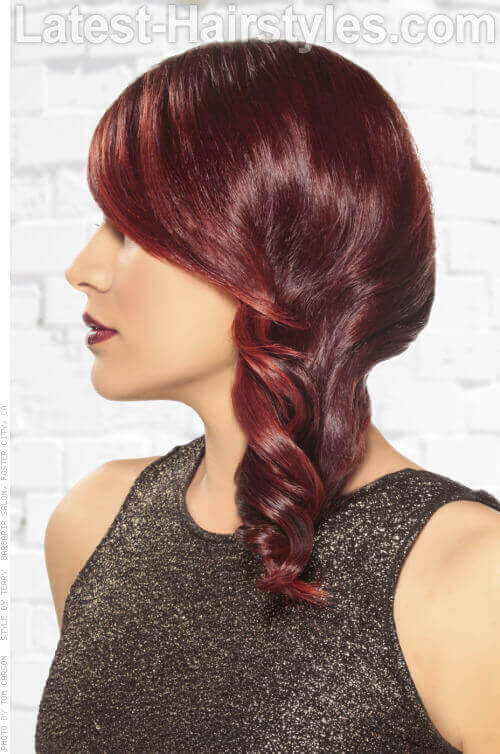 Incorporate your bangs into this romantic, side-swept, curly upstyle. Prep dry hair with a heat protectant. Using a 1-inch curling iron, curl hair vertically. Flat iron bangs. Rotate flat iron towards face to bend ends under. Place two fingers together and wrap curled hair around fingers, leaving the ends free. Place bobby pin through middle to curl wrap. Continue working until all air is pinned. Leave a few face framing tendrils out. For long lasting hold, try Aveda’s Force Control. This style will work with all face shapes and those with thin to medium hair types. A simple French twist with texture is a style that is perfect for a traditional or vintage-inspired wedding. Apply a texturizing spray to dry hair. Using a large barrel curling iron, curl hair working in large sections. Section off back combed section. Divide bottom section into three sections and backcomb the middle section and the inside of the outer sections. Take the outer section and wrap over middle section to the other outside section. Release top section and twist together with the bottom section. Secure end of twist with bobby pins. Gently rake fingers through sides to create texture. To create texture and volume in dry hair, try Oribe’s Dry Texturizing Hairspray. This style will work on oval, heart, triangle face shapes and with all hair types. Looking for a romantic and free spirited hairstyle? Try Heidi braids! Prep air dried hair with a small amount of Argan oil. Gather hair just behind ear and create a simple three-strand braid. Wrap braid around head towards face and bobby pin in place. To make your hair look extra shiny and healthy, try Moroccan Oil’s Luminous Hairspray. This style will work with all face shapes and hair textures. Not up for an extravagant upstyle? No worries! Try an enhanced version of your everyday blowout to feel like your best you. Prep freshly shampooed hair with a frizz-blocking blow dry lotion. Separate the front of your hair from the back. Clip back section out of the way. Working in small sections until all hair is dry. 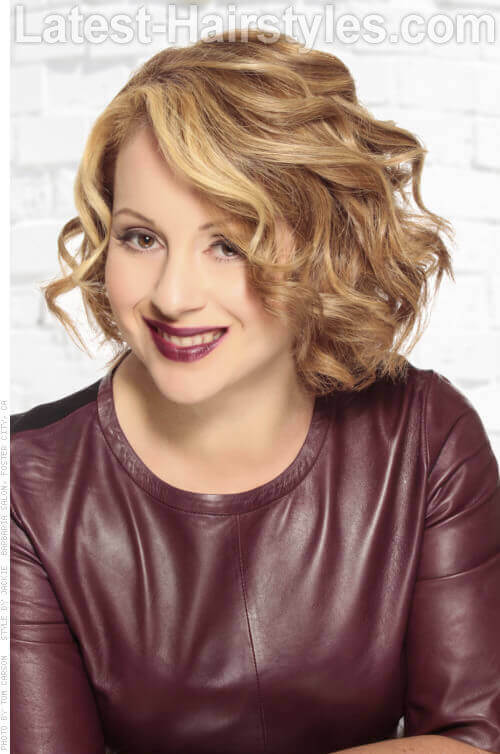 Smooth and curl ends with a large barrel curling iron. To keep your hair looking perfect through all of the wedding events, try Living Proof’s Prime Style Extender. Love the drama and beauty of the 1920s? Try this Great Gatsby-inspired style to compliment your vintage wedding aesthetic. Using a 1¼-inch curling iron, curl hair vertically and working in large sections. Set style with strong hold hairspray. To protect your hair from heat damage and create long lasting curls, try Davines’s No. 9 Structuring Mist. This style will work with all face shapes and hair types. This gorgeous style lies at the intersection of modern and vintage and is perfect for a low-key wedding. Starting with blow dried hair. Grab a small section from the front of the part. Create a small pouf and bobby pin in place. With the tail of the pouf, create a pin curl that curls away from face. Secure with a bobby pin. Create two more pin curls moving down the side and bobby pin in place. 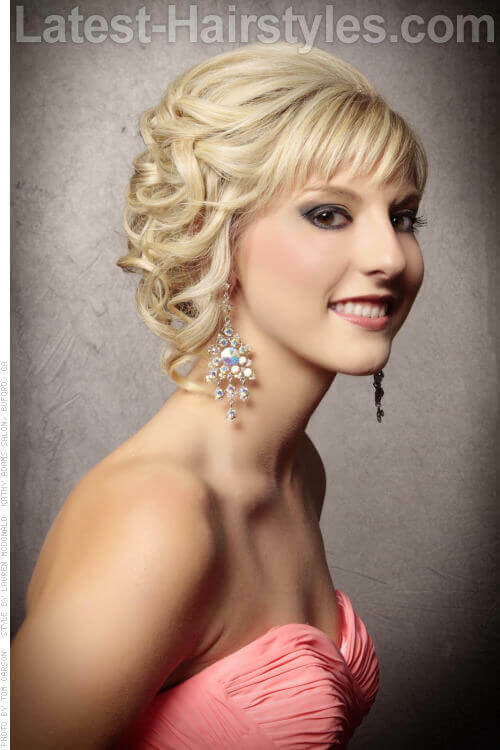 Using a 1-inch curling iron, curl the side with the pin curls towards the face in one large vertical curl. Curl opposite side away from face. For a flexible hold hairspray try Onesta’s Create It. 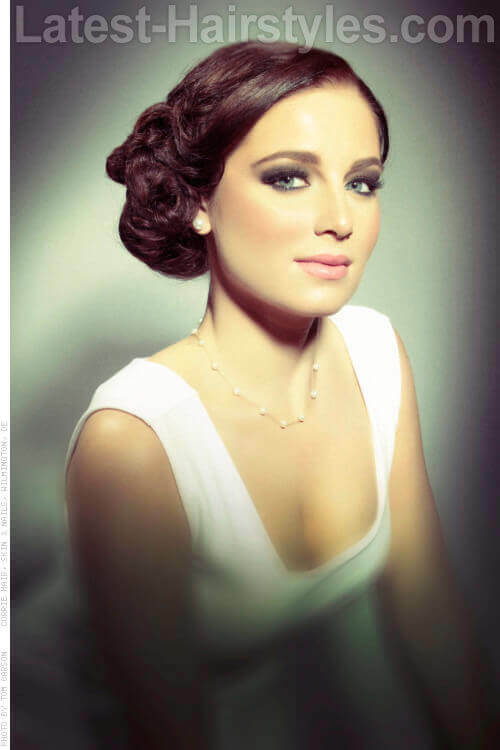 If you love your short hair, don’t feel pressured to grow out your hair just for your wedding! 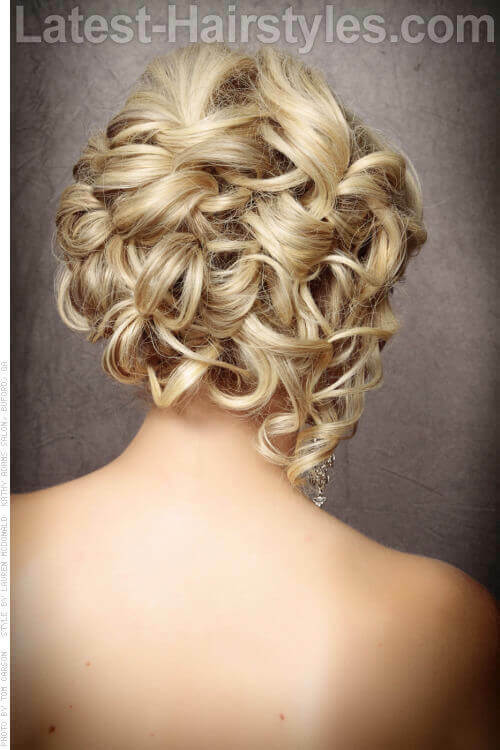 Try this gorgeous curly bob and feel extra confident in your swoon-worthy bridal ‘do. Starting with air dried hair, apply a small amount of styling cream. Working in small sections, curl hair with a curling wand. For frizz-free curls and protection against humidity, try Onesta’s Smooth & Shine. This style will work best on oval, heart, oblong and triangle face shapes. It will work with medium to thick straight, wavy or curly hair types. Looking for a simple DIY wedding style? 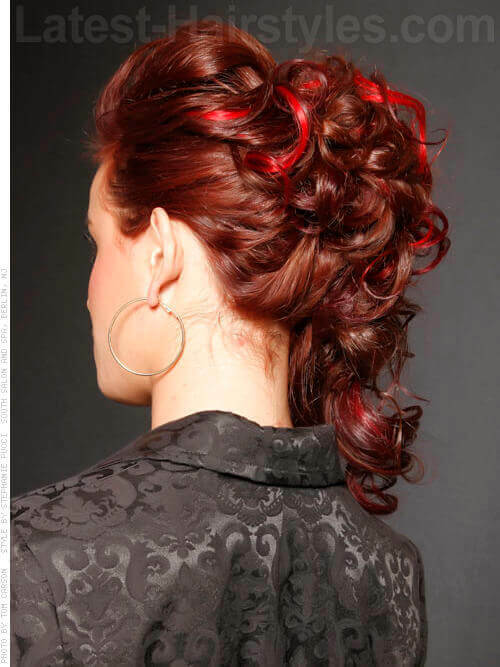 Try this beautiful curly ponytail with extra volume. Starting in the nape of the neck, curl hair vertically with a 1-inch curling iron. Continue working until all hair is curled. Backcomb top section and secure in a small pouf. Pull rest of hair into a ponytail just under crown. Lightly backcomb ponytail for fullness. Prep hair with Aveda’s Brilliant Damage Control to prevent against heat damage. Add a hint of vintage to any wedding event with polished victory rolls. Prep blow dried hair in a small amount of gel. Create a section from the corners of the forehead to the crown and clip the back section out of the way. Divide top section into two small sections. With the first section, backcomb the base of the section and then roll hair. Just underneath the top roll, create large pin curl. Secure with bobby pins. Smooth back section into a ponytail. Take a small section from ponytail and wrap around elastic. Secure with a bobby pin. 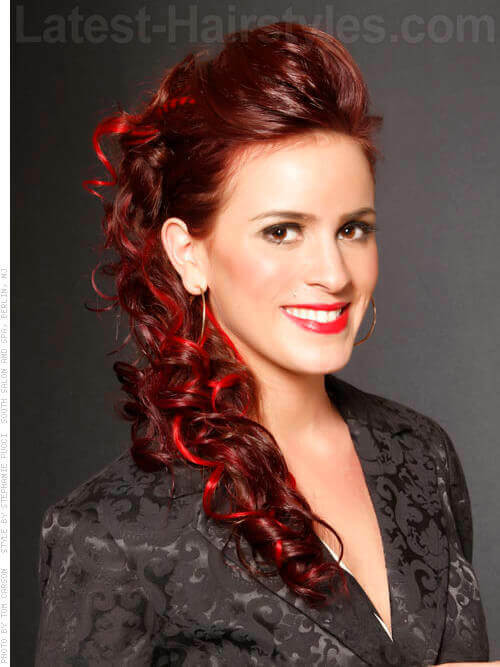 Using a large barrel curling iron, curl ponytail into one large curl. For a smooth and shiny finish with a medium hold, try Aveda’s Confixor. Looking for a wedding style that shows off your curls, but keeps them off your neck? Try this playful and curly upstyle! Prep wet hair with a curl enhancing crème followed by a medium hold gel. Scrunch out extra water with a microfiber cloth or an old t-shirt. Twist curls in alternating directions and in varying sizes. Dry hair with a diffuser. Scrunch in a shine enhancing serum. Gather hair at nape of neck. Twist hair up towards crown. Place bobby pins on both sides of twist. Allow ends to be free and arrange as desired. Aveda’s Be Curly Curl Control intensifies curls and helps protect curls against frizz. 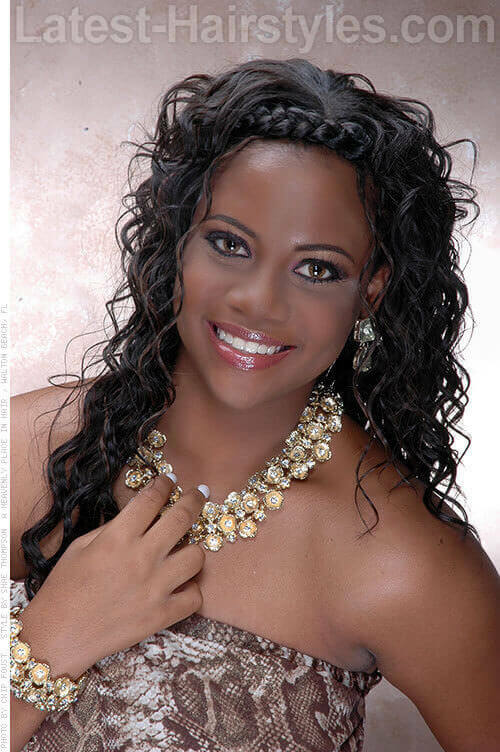 This style will work for all face shapes and medium to thick hair types with curly hair. Chignons are super easy to do and look like you’ve spent several hours trying to perfect it. Spice up this classic style by adding a small braid that weaves around the chignon. Apply a small amount of shine enhancing oil to blow dried hair. Near the bang area create a small three-strand braid. Tie the two sections into a loose knot. Wrap one side towards ear and around knot. Bobby pin in place. Wrap the other section down towards neck and around knot. Bobby pin in place. For moisturized locks with tons of shine, try Aveda’s Dry Remedy Daily Nourishing Oil. This style can be modified to be looser if desired. Just place clear elastic bands around each section and secure bobby pins to the elastic to help the style hold. 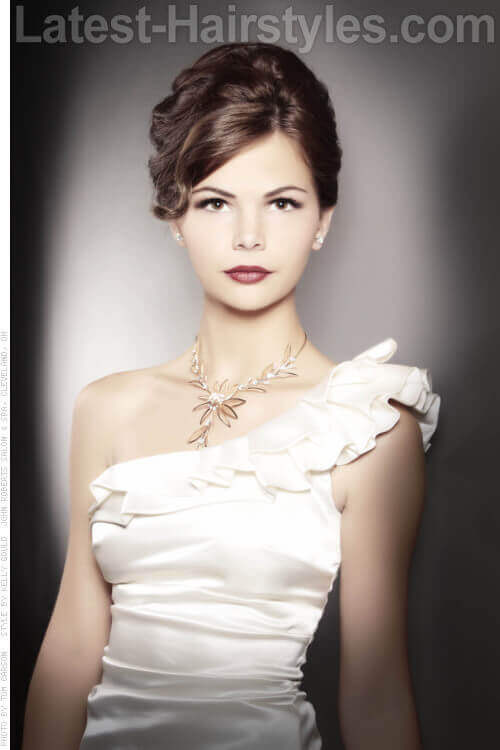 If you are thinking of wearing your hair down for your big day, consider a romantic side-swept style. It will keep your hair in place all day and you won’t have to fret over bad weather or busting move on the dance floor. Apply a thermal heat protectant to air dried hair. Curl hair vertically using a one-inch curling iron. On the side of the part, create a French braid starting just about the eye brow and wrapping around the back of the head to the nape of the neck. Tie braid off with a clear elastic. Lightly bobby pin loose hair to braid. Looking for a hairspray that will make even the wiliest of hairs stay in place? Try Aveda’s Force Control! Just curl the mid-lengths and ends to create movement and body. A chic graduated bob is always in style, even at a wedding! Jazz up your everyday bob by adding loose curls that frame your face. Apply a styling crème to blow dried hair. Using a curling wand, curl hair in alternating directions. Apply styling pomade to ends and finger comb through curls. Finish with light mist of a flexible hold hairspray. To break up curls and create definition with a satin finish, try Aveda’s Control Paste. This style will work with all face shapes and medium to thick hair types. Curl the section closest to your face towards it for an Old Hollywood-esqe feel. Are you looking for a way to show off your gorgeous natural texture and your fashion forward side? Make an unforgettable entrance on your big day with this natural style! Apply a curl crème to wet hair. Emulsify a small amount of styling pomade between palms and sculpt hair upwards and smooth to desired height. For shine and curl definition, try Carol’s Daughter’s Mimosa Hair Honey. This style will work for oval, heart and triangle face shapes. It will work for medium to thick curly hair types. For a romantic style with texture and playfulness, try adding a headband braid. Starting with damp hair, apply a curl crème and medium hold gel. Twist varying sections of hair. Gently fluff hair with fingers. Take a medium-sized section of hair from the side and create a three-strand braid. Wrap braid around front and bobby pin to opposite side. For defined and frizz free curls, try Aveda’s Curl Controller. 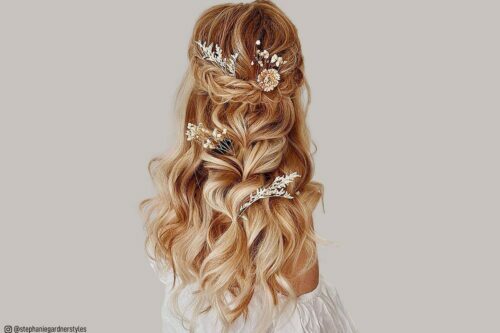 No matter what sort of theme you are dreaming of for your wedding day, one these wedding hair ideas is sure to catch your fancy!